This was the main topic of the 2019 Innovation Summit: in Tel Aviv on March 31st at the Renaissance Hotel. The initiative was held by The Embassy of the Netherlands which stated the disrupting innovations in entire industry. For now innovations start from the products we use, the food we eat, the pills we have and medical treatment we receive alongside with efforts from robotics industry. The first hype around 3D printing was in 2014 when numerous companies started to learn this option for prototyping and testing new technologies. It was the time when new vendors developed new engines. Among them were HP with well-known Jet Fusion enterprise 3D printing system, Stratasys announced J750 printer, SAP and UPS released 3D printing on demand etc. Things have been stable during next 4 years and now in 2019 the industry leaders accepted the new challenge connected with the food and medical printing. This was the main subject which was delivered by The Embassy of the Netherlands. They have invited speakers who shared insights on R&D in the area of food printing and provided the examples of real-world hardware applications and their scalability. In 2014 it was discussed by industry experts and the Natural Machines were first ones who released Foodini. It was Android 10kg food printer with the Wi-Fi slot and the recipe book of Natural Machines’ community site. 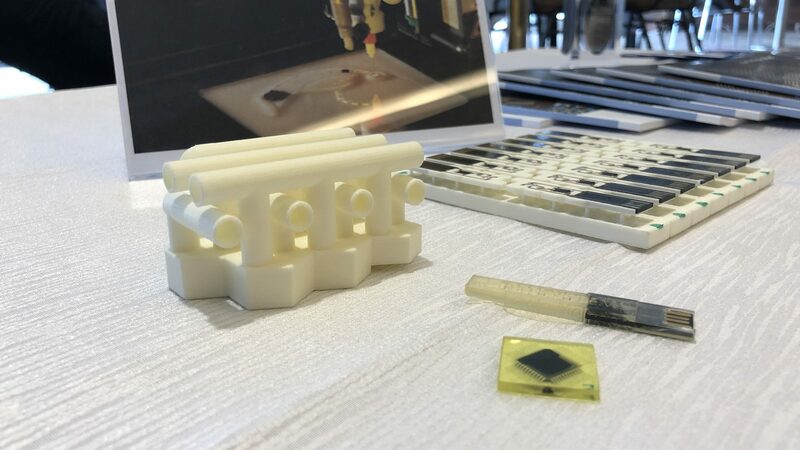 Innovation Summit – 2019 covered the topics of Flexible Electronics, 3D Printing and Robotics for Manufacturing & Service supported by TNO as an independent R&D center and AMSystems.